The winter weather can be harsh on your skin, causing dryness and a number of other issues. However, there are steps you can take to help keep your skin moisturized and healthy, despite the dry, cold air that typically moves in over the winter months. Our skin care guide will help you get started. If you’re experiencing dry flakes in your hair during the winter months, you could be suffering from dandruff, a condition that develops when the scalp overproduces oil and yeast begins to grow. Using a quality shampoo can help combat this issue. There are specific shampoo products designed to fight against dandruff and restore a normal, healthy balance to your hair. Sun spots aren’t just found in elderly individuals; even younger people can develop them, particularly during the winter months. While the best advice is to keep your skin protected from the sun, there are other things you can do to eliminate them when you need to be out in the sun. Laser treatments are one option. However, retinol pads can be a more cost-effective home remedy. The proper use of sunscreen is also essential. We’re not talking goose bumps, but some people have small reddish spots along their arms during the winter months. This is caused by a condition called keratosis pilaris. Using a grain exfoliator can help, as well as a good hydrating lotion. Hydrocortisone cream is an effective way to reduce swelling and diminish the appearance of these bumps when you do have an outbreak. Some people suffer from rough, scaly patches on various areas of their body, especially when colder temperatures and dry air exist. The elbows and knees are the most likely places for this problem to occur due to the cell turnover rate in these areas. A good skin repair lotion can help by providing the nutrients the dry skin requires and protecting the skin from rubbing on your clothing. Your hands and nails are exposed to a lot at all times of the year, but the harsh winter weather often has a major impact. This is especially true if you frequently polish your nails or go to the salon for nail treatments. 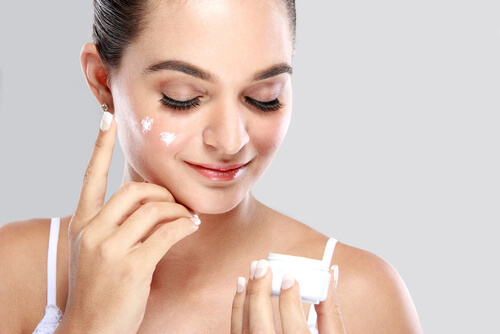 Using a good moisturizer is critical to relieve the dryness. Reapply often to help protect your hands and nails from even further damage. While some people, women in particular, tend to avoid shaving as often in the winter, the dry air can make ingrown hairs and razor bumps more prevalent. Before you shave, apply a scrub and then a moisturizing shaving gel. If you want a longer-lasting solution, consider laser hair removal treatment. Over time, these treatments will eliminate the need to shave entirely. The winter is a bad time for your skin due to the dry air and harsh temperatures. However, there are steps you can take to encourage healthy skin, despite the poor conditions.